Download the application note "Using the AETA SIP Server" by clicking on the icon. Why a SIP server ? With its SIP service, AETA Audio Systems offers its customers easy-to-establish connections, but also safer management. The customers avoid the complexity and the cost of setting up a server, as well as the burden of its maintenance, while at the same time providing greater security against hacking. The SIP configuration does not change from one link to another, even in mobile use. Little change has to be done on the access router, and even on a possible firewall. In fact, in the case of a standard consumer “box”, usually there is just nothing to change. Only one number (SIP URI) must be known in order to set up a call to a new destination. Ports and redirections have to be set through the routers/firewalls, a tedious process that may involve busy resources and take much time. 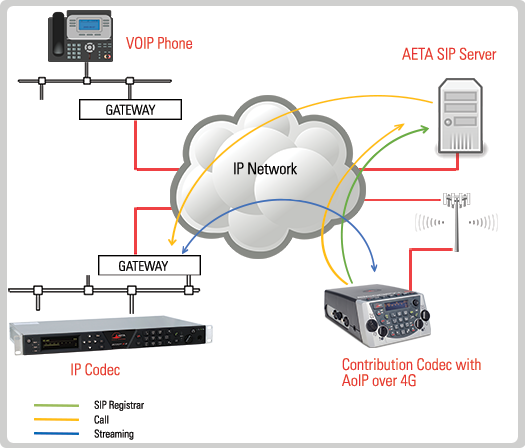 For maximizing this potential while easing the implementation, AETA has set up a public SIP server, dedicated to Audio over IP broadcasting applications. Our customers can get accounts and register their audio codecs on this server. AETA now integrates free and pre-registered factory SIP accounts into all AETA products out of production lines. These accounts are exclusive for the unit and offer quick and easy connection to the SIP server. A premium account can be used on any SIP agent, provided that this agent is compatible with the server. The data may be transferred into another device if necessary. The SIP numbers allocated to premium accounts observe specific rules that allow clear and simplified management when you have many accounts. For calling a number inside the same group, you can dial just the last 4 digits. Optional service, on request. Applies to the whole group. When this service is selected, AETA provides the subscriber a “hunting group number” and an additional series of accounts (in same count as the regular numbers) that can be used as a hunting group. When this feature is activated, the server does not relay to the group calls which are originated from devices not belonging to the group. When this feature is activated, the server does not forward calls sent by a member of the group towards devices that do not belong to the group, except 15000 (AETA test codec, which stays open for testing). When this service is selected, AETA provides for every SIP account an on-line access to the server (login+password) that allows to edit ad libitum the password of the SIP account. When this service is selected, AETA provides to the subscriber, on each calendar quarter, a log of the calls. The fixed subscription allows a device registered on the server to set up connections of unlimited duration with any other device (or agent) also registered on the server. Please contact your local distributor, or our sales department by e-mail contact[at]aeta-audio.com or by phone +33 141361200. If you already have subscribed SIP accounts before the setting up the new premium service, what should you do? Your SIP accounts automatically migrate to the premium subscription at no additional charge or rate change. For more information on the new Premium SIP service and for the activation of the optional features, please contact your local distributor or contact us on +33 141361200. High availability with 24/7 monitoring. Redundant and backed up power. To maintain the service in all circumstances, the server is secured by a backup server, which is permanently active. In case of a failure of the main server, or for a maintenance action, the service can make a “hot” switchover to the backup server, while keeping all functions identical. We also propose a STUN server (more…) under similar reliability conditions. Our SIP server includes a “RTP proxy” feature that can relay the RTP streams exchanged between two codecs or SIP “agents”. This relay feature is activated automatically whenever needed (usually, because of a NAT router located on the Internet access of a codec).